CAPSULE REPORT: People who don’t like yogurt—but need to eat more of it—may find their solution in Wallaby, an “Australian-style” yogurt that is much thinner than traditional yogurts. We find it a cross between yogurt and a smoothie: it actually has a sauce-like consistency. Although it’s packed with probiotics L. acidophilus, L. bulgaricus, S. thermophilus and bifidus, there’s no tanginess—just subtle fruitiness. It doesn’t assert itself, but is calm, comforting, refreshing—and very nutritious. Wallaby Yogurt was founded by a California couple who discovered “Australian-style” yogurt on a vacation Down Under. They liked the yogurt so much—and felt, perhaps correctly, that it was different enough to attract a profitable segment—that they left their jobs in the technology industry and started a company named Wallaby Yogurt, the small- to medium-size kangaroos of islands of Australia, New Zealand and Tasmania. The product launched in 1996 in the Bay Area. You’ll notice two things about Wallaby Yogurt. First, it’s thinner, sauce-like, almost drinkable. Second, it’s much less sweet, with a more subtle flavor profile than other yogurts. The difference in the consistency is a result of lack of starch or gum thickeners. Instead, Wallaby uses more concentrated milk and incubates their yogurt for 8 to 9 hours—double the industry norm. The yogurt must be handled very gently to avoid losing viscosity: While a typical yogurt plant can make 3 to 5 batches a day, Wallaby Yogurt can make just one. The slow incubation process also delays acidification and results in a milder product that requires much less sugar. Lowfat flavors, at 150 calories per 6-ounce cup: Banana Vanilla, Black Cherry, Blueberry, Lemon, Maple, Orange Passionfruit, Peach, Plain, Raspberry, Strawberry, Strawberry Banana, Vanilla. Nonfat flavors, at 130-140 calories per 6-ounce cup: Blackberry, Mango Lime, Peach, Plain, Raspberry, Strawberry, Vanilla Bean. All of the flavors we had were enjoyable, in a low-key way. These are not flavor-forward yogurts: There is no blast of Blueberry, Lemon, Strawberry or whatever you have selected. In a way, Wallaby is all about the texture: The natural fruit flavors are subtle, delicate, secondary. Having enjoyed six of them, we have no need to taste six more: We’re certain the experience will be equally calm and pleasant and refreshing. We’d be equally happy with any. Wallaby makes an excellent dressing for fruit salad: The perfect, sauce-like consistency, doesn’t “glop” atop the fruit, but integrates nicely into the presentation. 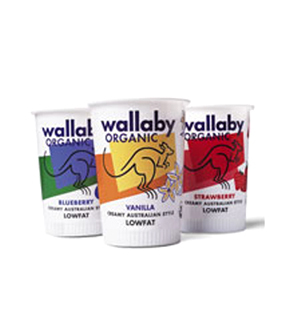 As an organic product, Wallaby Yogurt uses high-quality, rBST-free organic milk. It is a probiotic product, containing live and active acidophilus, bifidus, bulgaricus, and thermophilus cultures which are naturally beneficial to the digestive tract. Research has only begun to scratch the surface about the health benefits of probiotics, but suggests that consumption of probiotics may positively enhance the immune response and allow for improved resistance to infectious diseases. Probiotics are the healthy bacteria found among the intestinal microbiota, the living microorganisms in the intestinal tract that are necessary for proper digestive health. They are responsible for protective effects, including healthy turnover of cells in the intestinal tract, production of essential nutrients such as short-chain fatty acids and amino acids, stimulation of intestinal immunity and prevention of overgrowth of harmful organisms. Probiotics can also be found in fermented food products such as yogurt, and in food supplements. There may be a strong indication for the use of probiotics in the treatment of numerous gastrointestinal diseases, including irritable bowel syndrome. Wallaby yogurt does not contain any gluten, eggs, wheat, peanuts, tree nuts, shellfish, or soybeans. Lactose-intolerant people generally can eat probiotic yogurts like Wallaby: The live cultures break down the majority of the lactose in the milk, allowing it to be digested without causing negative reactions. Contact your physician, who may suggest that you try a small amount. And, as mentioned at the top, people who don’t like yogurt but have been told to eat more of it should appreciate its non-tart flavors—like a delicate fruit pudding. Available at fine supermarkets and food stores. For a store locator, click here.